In his state-of-the-nation address to the Federal Assembly last November, President Dmitry Medvedev announced his decision to appoint a special envoy to the North Caucasus. Medvedev has now made good on that promise. The man now in charge of the newly created North Caucasus Federal District is Alexander Khloponin. Like Medvedev, Khloponin is a politician of the new generation who made his career in the post-perestroika period. Khloponin was born in 1965 in Colombo, Ceylon (now Sri Lanka), the son of a Soviet translator attached to the foreign trade mission. His first job, at the height of perestroika, was in the department of government credits at Vneshekonombank USSR. After the collapse of the Soviet Union and the beginning of market transformations in Russia, Khloponin went into business. His successes included a five-year stint (1996-2001) as chairman of the board and director of Norilsk Nickel, the metals giant. He then moved into the political arena. In 2001, he won a gubernatorial election in the Taimyr Autonomous District in northern Siberia and then, in 2002, won a tight race for Governor of Krasnoyarsk. Soon after becoming governor, Khloponin began to exhibit national ambitions. He actively promoted a plan to unite the Krasnoyarsk, Taimyr and Evenk regions, part of a larger idea of combining Russian regions championed in the early and mid-2000s by then-President Vladimir Putin. Khloponin suggested making his region a “test project.” The unification of those three regions turned Khloponin into a politician of national stature. He is also a member of United Russia’s political council. Despite these successes, Khloponin’s appointment as the North Caucasus envoy comes as a surprise. In the two months since Medvedev first voiced the idea of a special envoy to the North Caucasus, most observers assumed that the post would go either to a “silovik” – a politician from the security or military forces – or to an influential member of the local business elite. Will the prime minister and the president be able to share Khloponin? Will this complicated system of “double subordination” create difficulties in creating the best response to problems in the Caucasus? The ambiguities with the position do not stop with Khloponin. The composition of the newly created North Caucasus Federal District also remains unclear. Until 2010, its territory was part of the Southern Federal District and included 13 Russian regions. The new district will consist of the Stavropol Territory plus six republics of the North Caucasus. It is unclear, however, why Kabardino-Balkaria and Karachayevo-Cherkessia were included, but not Adygea, which remains part of the Southern Federal District. Despite this division, these three North Caucasus regions share many problems in common. Also not part of the new North Caucasus District is Krasnodar Territory, which sits on the Black Sea and shares a border with the breakaway Georgian region of Abkhazia. Krasnodar’s capital, Rostov-on-Don, is also the capital of the North Caucasus military district. It is the seat of the Caucasus branches of the Ministry of Internal Affairs, the Federal Security Service, and Russian Customs, as well as of academic centers working for the entire North Caucasus region. While there is no denying that the problems in the Caucasus require special attention, the appointing of the special envoy has so far created more questions than answers. The decision to appoint a “special envoy” was made behind the scenes, without expert and public discussion – for example in the Duma, the Public Chamber or in the media. 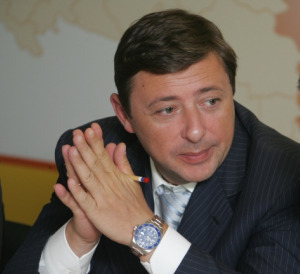 And although Khloponin has administrative experience, it is doubtful that his past positions have uniquely qualified him for the challenges he will face in the North Caucasus. It is doubtful that Khloponin came into the position with clear plans to change the situation there for the better, but his team may be able to come up with plans to modernize the Caucasus. However, crucial questions remain, for example, Who will be on Khloponin’s team? And how will those team members be chosen? No matter what plans the new special envoy develops, he is only a representative of the president and the federal government. For Russia’s strategy in the North Caucasus to become truly new, contemporary and effective, the ruling tandem itself will have to substantially revise its perception of this region. To do this, it must first adequately assess the nature of the threats emanating from there, however difficult that is to do. Secondly, it must understand efforts to modernize Russia as a whole while retaining archaic administrative models in the Caucasus will not work. For now, it remains to be seen how quickly the new man in the North Caucasus will get up to speed and how much his approaches will differ from those of his predecessors. Sergei Markedonov is a political scientist and expert on the Caucasus.